Immigrants from Bohemia and Moravia, called the “Czech Homelands” by the key scholar of Milwaukee’s Czech community, were one of the first ethnic groups to settle in the Milwaukee area in the middle of the nineteenth century. Then part of the Austro-Hungarian Empire, today these lands form the Czech Republic, the western-most Slavic nation in Central Europe. The migration continued until World War I and was relatively small compared to the numbers sent by neighboring Germany. 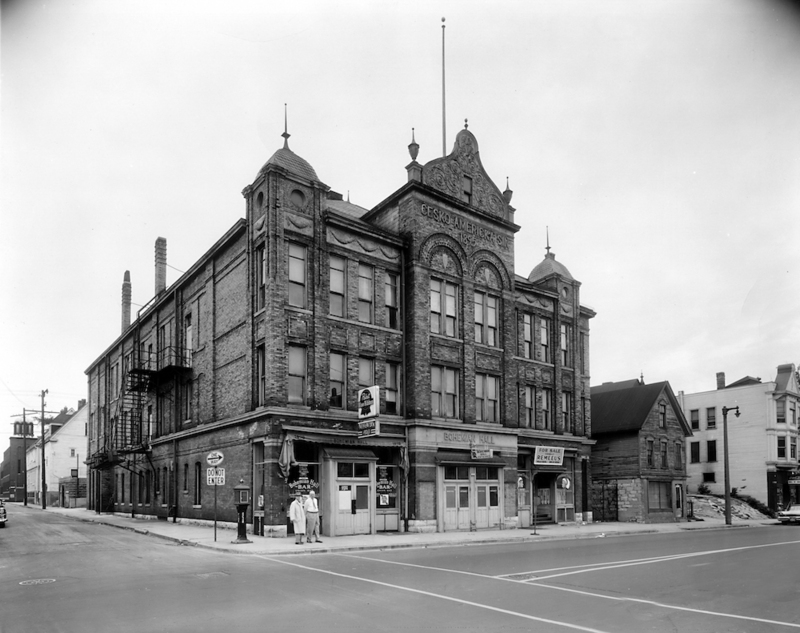 The community was comprised of around 7,000 to 8,000 people in the metro area in the early twentieth century and continued to have a major cultural presence in Milwaukee well into the twentieth century. Czech immigrants were a diverse group, economically, politically, and by religious affiliation. As with other European migrants, they came to Milwaukee to work in the burgeoning industrial economy, often in skilled trades. They also worked as merchants, publicists, and founded key local cultural institutions. Even prior to the 1846 incorporation of Milwaukee, Czech immigrants had arrived already and were active in the city’s economic life. Isaac Neustadtl and Solomon Adler are believed to be the city’s first Czech settlers. The two Jews from Bohemia, who arrived in 1844, were both important to the city’s early history. Neustadtl operated a grocery store and an insurance business, and he additionally allowed Milwaukee’s early Jewish population to conduct services in his home. In 1852, he was elected alderman of the Second Ward. In 1851, he was one of the founders of the German-English Academy (now the University School of Milwaukee) and later would be one of the managers of the Milwaukee Musical Society. Solomon Adler’s brother, David, arrived in Milwaukee in 1852, and shortly thereafter they opened a clothing store. In 1857 David Adler bought out Solomon’s share in the company and reorganized it into David Adler & Sons Clothing Company, which was a successful clothing maker for decades. Czech dissidents from the failed 1848 revolutions in Europe also came to the city. Vojta Náprstek left Bohemia in 1848. Some scholars credit him with setting the stage for Czech immigrant political and literary activities. Náprstek’s publication, the Milwaukie Flug-Blätter, was published in German due to troubles with procuring Czech-language printing materials. It undoubtedly had a higher German than Czech readership as German immigration to Milwaukee accelerated. However, Náprstek’s publication reflected important legacies of the 1848 revolution. It was decidedly anti-religious, especially anti-Catholic, which was a significant part of a Freethinker tradition in Bohemia that responded to the region’s control by the Catholic Austrian Empire. Hans Balatka arrived as a revolutionary refugee from Moravia in 1849 and joined with Rufus King, Jacob Mahler, and other members of the city’s new and growing German community to form the Milwaukee Musikverein (Music Society). Balatka acted as the Milwaukee Musical Society’s director through 1860. Czech immigrants in the post-1848 period formed institutions intended to maintain a Czech national culture in Milwaukee, starting with Slovanská Lípa (Czech Society) in 1866. In June 1868, Milwaukee’s Czech population opened the area’s first Sokol Gymnastics Union. Both groups grew quickly, with the Czech Society opening the Lipa Academy in 1869 at 716 Prairie Street. The Lipa Academy focused on an educational program in Czech history. While the educational center taught immigrants and first-generation Czech-Americans English, it also provided Czech-language instruction for those children who had been raised as English speakers. In 1873 the Sokol and the Czech Society merged, building the Lipa-Sokol Hall just down the street from the Lipa Academy. The Lipa-Sokol Hall was intended to be a space for social, cultural, educational, and gymnastic activities within the community, while also serving as a resource and informational center for those Czechs stopping temporarily in Milwaukee on their journeys west. In 1890, Lipa-Sokol merged with another area gymnastics club, the True Brothers Sokol, to form the National Gymnastic Association. This merger paved the way for the opening of Bohemian Hall in 1895 on the corner of 12th and Vine Streets on the city’s near north side. Bohemian Hall was a multilevel structure that fulfilled numerous functions for the city’s Czech population. Its basement contained a gymnasium, and its second floor held a theatre along with a mezzanine with meeting rooms that acted as classrooms and library. A social club also developed for the area’s Czech women. The Telocvicna Jednota Pani a Divek (Ladies and Girls Gymnastic Society) formed in 1899. The club’s efforts helped to pay off the cost of the newly constructed Bohemian Hall. The Milwaukee Czechs built financial institutions, including the Bohemian Mutual Savings, Loan and Building Association and the First Bohemian National Loan and Building Association, founded in the 1880s. In the early twentieth century, Czech immigrants continued to make their mark on Milwaukee business. In the metal trades, for example, Edward Jan Stanek was a founding partner of the Stanek Tool & Die Company. Sausage-making drew a number of Czech immigrant meat cutters, including Frank Klement, whose sons followed in their father’s footsteps to build the Klement Sausage Company. The community welcomed the collapse of the Austro-Hungarian Empire at the end of World War I and the founding of Czechoslovakia. In the 1930s Czechs held numerous anti-Nazi rallies in support of the people in their homelands. During the years of World War II, Czech residents of the Milwaukee area joined with other representatives of eastern European groups, such as the Polish National Alliance and the Croatian Central Committee, to protest the Nazi incursion into Eastern Europe, and then the Communist takeover of Czechoslovakia after World War II. In the first half of the twentieth century the Czech community began to disperse, to the South Side and West Allis, and eventually other suburbs. The old North Side enclave was settled by new African American migrants. The institutions that had been developed to minister to the needs of the area’s Czech population began to branch out to broader populations or to decline. First Bohemian National Loan and Building reorganized into Prudential Savings and Loan Association in 1950. Bohemian Hall fared much worse. It was used less frequently in the postwar period, parts of it being loaned out to a metal fabrication business and its only connection to the North Side’s remaining Czech population being its barroom. By the mid-1960s, the Sokol moved out of the Bohemian Hall and into the facilities of the International Institute on Highland Boulevard. In October 1969, a fire completely destroyed the Hall. The Sokol continued to operate. Today, it offers gymnastics activities for youth and social activities for adults at the Norway House on Oklahoma Avenue. The Sokolice, for Czech women, continues to operate. In 1943, along with three other Slavic national groups, it held an ethnic fair, which became the annual Holiday Folk Fair International. ^ Anton Daniel Acker, The Czech Community of Milwaukee, 1848-1998 (Milwaukee: Milwaukee County Historical Society 2001). See also Vera Laska, ed., The Czechs in America, 1633-1977: A Chronology and Fact Book (New York, NY: Oceana Publications, Inc., 1978), vii; Miloslav Rechcigl, Jr., Czechs and Slovaks in America: Surveys, Essays, Reflections and History and the Contributions of Czech and Slovak Immigrants in America and their Descendants (Boulder, CO: East European Monographs, 2005), 191. Census data indicates that the vast majority of the area’s Czech Americans originated in the Bohemia region. Figures tabulated from Steven Ruggles, Katie Genadek, Ronald Goeken, Josiah Grover, and Matthew Sobek. Integrated Public Use Microdata Series: Version 6.0 [Machine-readable database]. Minneapolis: University of Minnesota, 2015. Tabulations from the 1920 censuses for individuals from the four county metro area who responded that they were born in Czechoslovakia or reported their mother’s mother tongue as Czech. ^ Rechcigl, Czechs and Slovaks in America, 86-87; Acker, The Czech Community of Milwaukee, 8. ^ Rechcigl, Czechs and Slovaks in America, 86-87. ^ Rechcigl, Czechs and Slovaks in America, 192; Winston Chrislock, Charles Jonas (1840-1896): Czech National Liberal, Wisconsin Bourbon Democrat (Philadelphia, PA: Balch Institute Press, 1993), 23, 38-39; Acker, The Czech Community of Milwaukee, 11-12. Charles Jonas, from Bohemia and exiled outside Prague following 1848, arrived in Racine in the mid-nineteenth century, where he founded Slavie, a Czech-language weekly. Slavie was decidedly pro-labor, which frequently put it at odds with the Milwaukee Sentinel. Moreover, Jonas trained a number of editors in the Milwaukee area who would later use their knowledge to found other Czech-language liberal and Freethinker newspapers throughout the country. Karel D. Bicha, “Karel Jonas of Racine: ‘First Czech in America,’” Wisconsin Magazine of History 63 (Winter 1979-80): 128-129. ^ Acker, The Czech Community of Milwaukee, 8. ^ The Sokol movement was developed in Prague in 1862 as the Falcon Movement. It modeled its physical fitness activities after the German Turners while also focusing on the development of the intellect and character. Acker, The Czech Community of Milwaukee, 15-18; Jan Habenicht, History of Czechs in America (St. Paul, MN: Czechoslovak Geneological Society International, 1996), 310. ^ Acker, The Czech Community of Milwaukee, 15-18, 29, 33-35. ^ Acker, The Czech Community of Milwaukee, 33-35. ^ Acker, The Czech Community of Milwaukee, 35. ^ Acker, The Czech Community of Milwaukee, 31, 36, 48. ^ Acker, The Czech Community of Milwaukee, 54-56. ^ Acker, The Czech Community of Milwaukee, 41, 44, 47. ^ Acker, The Czech Community of Milwaukee, 38, 49-51. ^ Acker, The Czech Community of Milwaukee, 48-51. ^ Milwaukee Sokol/Sokolice, http://www.sokol-milwaukee.org/welcome.html, last accessed June 27, 2012, now available at http://www.sokolmilwaukee.org/, accessed July 14, 2017. Acker, Anton Daniel. The Czech Community of Milwaukee, 1848-1998. Milwaukee: Milwaukee County Historical Society, 2001. Bicha, Karel D. “The Czechs in Wisconsin History.” Wisconsin Magazine of History 53 (Spring 1970): 194-203. Walsh, Margaret. “Industrial Opportunity on the Urban Frontier: ‘Rags to Riches’ and Milwaukee Clothing Manufacturers, 1840-1880.” The Wisconsin Magazine of History 57, no. 3 (Spring 1974): 174-194. http://www.jstor.org/stable/4634885.